Barry’s teaching experience in the Denver area goes back to the early days of the Denver Folklore Center and Swallow Hill. Over the years, he has been performing – either solo or with various groups – at street fairs, fund raisers, coffee houses, churches, and so on. Barry’s background is in fingerpicked folk, blues, pop, jazz and classical styles. He teaches standard and ‘open’ tunings as well as bottleneck style. He enjoys working with students of all ages, from eight years old and up – whether they are just picking up the instrument for the first time or are interested in broadening or deepening their skills. 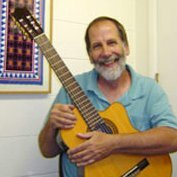 His goal is to teach the techniques involved in playing the guitar and to help students achieve the sound, style and repertoire they seek. With beginning students, Barry is a patient and caring teacher who will work at whatever speed is best for the student. Using standard notation and/or tablature, he’ll cover all the basics of playing the guitar, touching on the styles listed above.